Spinning a page-turning story of literary suspense that begins in the present and unwinds over almost a century, this unforgettable debut channels the haunting allure of Atonement as its masterfully woven web of lies, secrets, and betrayals unravels to a shocking conclusion Veteran con artist Roy spots an obvious easy mark when he meets Betty, a wealthy widow, online. In no time at all, he’s moved into Betty’s lovely cottage and is preparing to accompany her on a romantic trip to Europe. Betty’s grandson disapproves of their blossoming relationship, but Roy is sure this scheme will be a success. He knows what he’s doing. As this remarkable feat of storytelling weaves together Roy’s and Betty’s futures, it also unwinds their pasts. 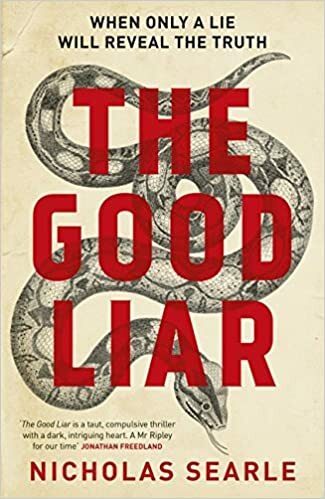 Dancing across almost a century, decades that encompass unthinkable cruelty, extraordinary resilience, and remarkable kindness, The Good Liar is an epic narrative of sin, salvation, and survival—and for Roy and Betty, there is a reckoning to be made when the endgame of Roy’s crooked plot plays out. I found the premise of this book by Nicholas Searle very appealing. An ageing con man is going for one last trick and I certainly found the start of book intriguing. Roy meets up with Betty and intends to defraud her. Initially I was quite amused. The book follows Roy’s attempt to con Betty however interspersed with his current life the book time shifts. These sections take us back through Roy’s life bit by bit. It is fairly well flagged so there is no confusion. I’ve read quite a few books that take this approach and have always found them readable in the past. However I found with this book it frustrated me. Parts of the book engaged me quite well however other parts – probably mainly the “life backwards” – did far less for me and so the shifts in time distracted me. I still find myself like the basic idea of this book and I did like some of the techniques used in it. However, for me, it was not particularly compelling and, frankly, Roy was not a likeable character. It is quite hard to review this book without disclosing important aspects of the storyline. I am sure others will find this book to their liking. What I would say is that I really did rather like the ending. Even if I’d worked out some aspects of it while reading the book it was good enough to satisfy me. I would read another book by this author and I hope he does come up with more stories.